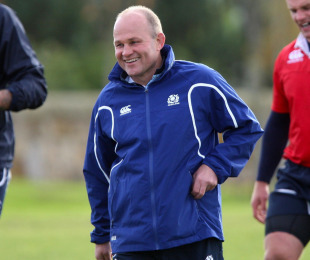 Scotland coach Andy Robinson believes that his side will not be carrying any excess psychological baggage when they take on the All Blacks at Murrayfield on November 13. The Scots have not beaten New Zealand in 27 attempts but Robinson believes that his confident charges, fresh from victory over Ireland and a series win over Argentina, are in the right frame of mind to tackle the challenge. "I haven't seen any hang-ups here so far," he said. "New Zealand are a cracking side, they have played some outstanding rugby this year. If you sit back and let them play they are the best team in the world. Even if you don't sit back and do go forward, they are a great side. But I'm not fearful of anybody. I have real confidence in the way the team is preparing. It's about them executing that under pressure. If we can't do that, we'll get beaten." Robinson has noticed a visible lift in confidence since the squad's return from Argentina and is relishing working with a tight-knit group of players. "There's real confidence among the squad," he said. "They have a lot of self-belief, and there's a great team spirit. I felt the team spirit was here when I first got involved and I have loved that. There is a belief and they all want to get on that pitch and perform. I have been enjoying seeing that belief and how it's growing." With his players having not been in action as a unit since June, Robinson has worked hard in training to replicate the pace and intensity of a Test match prior to the arrival of the All Blacks, with South Africa and Samoa also promising tough encounters later in the month. "It's something that mustn't be neglected," Robinson said. "It's something we have to look at in our planning. We can't start slowly. We must start well and that's what we have been working towards. "We have physically been able to put that into training, at times we have been training quite hard. We worked full-on for a certain amount of time on Tuesday in order to replicate that game experience."